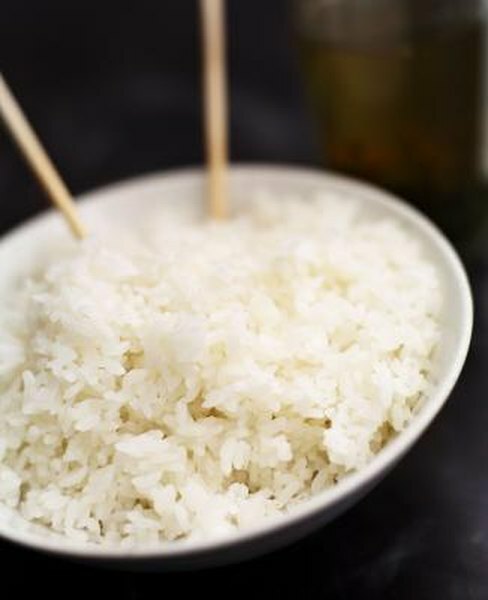 White rice is the main staple food for people in 34 different countries, and it provides 20 percent of the energy people around the world get from food, according to the Food and Agriculture Organization of the United Nations. White rice is a good source of niacin, riboflavin and thiamine, but rice by itself is not a complete protein. You need to pair it with other foods to create a meal with complete protein. Complete proteins contain all nine of the essential amino acids. Foods from animal sources, such as meat, eggs and dairy products, are complete proteins. Soy and quinoa are the only two plant-based protein sources that provide complete protein. Incomplete protein sources lack one or more of the essential amino acids. The missing amino acids in incomplete protein sources are called limiting amino acids. While white rice contains a lot of aspartic acid and glutamic acid, two of the amino acids, it doesn't contain much of the amino acid lysine. Lysine is the limiting amino acid for white rice, so if white rice is one of your main sources of protein, you need to consume another protein source that contains lysine to form a complete protein. Complementary proteins are ones that can be combined to form a complete protein. For example, when you combine white rice with beans, which are high in lysine, you form a complete protein, so rice and beans are complementary proteins. Peanuts are another complementary protein for rice. Pairing complete proteins, such as meat, fish or eggs, with incomplete proteins like white rice also provides you with complete protein. You don't need to consume complementary proteins at the same meal, but you do need to consume them in the same day. Brown rice is healthier than white rice. Although it is still an incomplete protein, it provides a lot more fiber. Eating a varied diet usually provides you with plenty of protein and enough of the essential amino acids. However, vegetarians may need to more consciously plan their diets to ensure that they get enough of the various amino acids. Go Ask Alice! : Complete and Incomplete Proteins in Grains and Vegetables?